Well, it sure has been awhile since I last wrote a blog for you guys, for which I do apologise. This, in turn, corresponds to it also being awhile since I last completed a finished knitted item. I thought at one stage that I could be a monogamous knitter, but gosh was I wrong. You see, like a few of you out there I’m sure, I have about six knitting projects on the go. I start something and then I cannot lie, I get bored and want to have that thrill of casting on a new project straight away. Then danger sets in with the continuous cycle of the thrill and then boredom jumping in. But hey no more as I am now determined to finish all of my projects that I have started before casting on something else. It is like a new challenge for me and by writing about this, I am putting it out there to the universe to make sure that this does indeed happen. Heels, toes and cuffs are by Fiberlily a wonderful new and up and coming indie dyer from Australia. You can check out her work at her Etsy store. 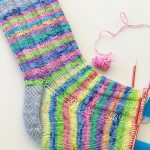 The colourway I used was called Balmy Blue on her base Aussie Sock. But I am warning you, you may become addictive to her lovely array of colours and blends that she has so magically put together. Don’t say I did not warn you!! 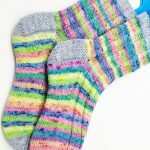 The rest of the socks was a rainbow sorbet sprinkles mini-set purchased from the amazing Scottish Indie Dyer Mothy and the Squid. She is one of my favourites and I do believe she does not need too much introduction. If you want to check out her range you can do so here. So all in all, am very happy with my first pair of hand knitted socks for 2018, even it if has taken me 3 months to make. I think I started these on New Years Eve 2017. Stay tuned as you may just see a few more finished items of mine coming up as I endeavour to plough through my WIP’s till they are all finished. Wish me luck with this!! I am very pleased to come across Woolswap few months ago. I am on my third one and I'm going to keep going at this. I love my woolswap, and am so excited with the two times I have done it, I wish my budget allowed me to every time! I love my woolswap, and am so excited with the two times I have done it, I wish my budget allowed me to every time! I would recommend everyone tries it at least once, especially the international ones because you get yummy wool and stuff from around the world!